2011 KTM dirt bikes and cool orange ktm motocross motos. The 2011 KTM dirt bikes have proved that once again this incredible company wants to be the market leaders of motocross bikes. From their humble beginnings in 1954 KTM have always wanted to push the boundaries of dirt bike manufacturing. They are one of the favorite brands of dirt bikes that are purchased every year, and continue to make incredible bikes. As they approached 2011, they wanted to explore far greater technology, and create the ultimate dirt bike. This incredible Austrian brand has had some defining characteristics for years enabling their dirt bikes to be the best. 2011 KTM dirt bikes have continued with the huge success of the PDS suspension, however, they have finally admitted that a linked system does in fact work better on their dirt bikes. With the new 350 SX-F, and the SX-F models being launched, they both have the new shock, whilst the 2 strokes will continue to use the PDS systems. Fuel injection is another area that has been adapted, and worked on as well as many other smaller areas of the bikes. The new 2011 KTM dirt bikes are some of the most welcome in the moto cross industry with riders, and competitors eager to see them perform. KTM have produced the first in-between dirt bike that ticks every box. Beginners often feel that the 250s is far too slow, and yet the 450s is too powerful. This allows the 350 model to appeal to a huge array of different people. To show case this amazing new style of dirt bike KTM has decided to place Stefan Everts in charge of the new bike, and show what it is capable of. Unbeatable KTM pit bikes & KTM motorcross motorcycles. 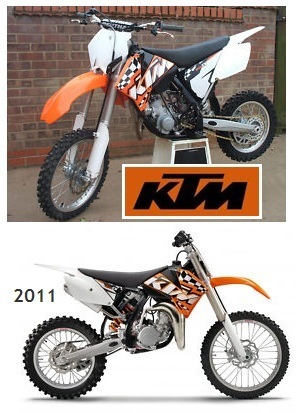 Many fans of the 2011 KTM dirt bikes have described the new 350 as the bike of the century, and with very good cause to. 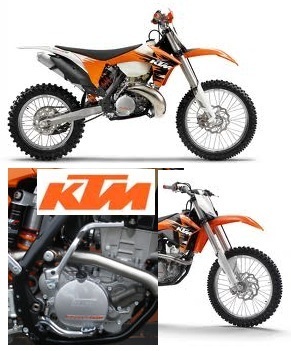 For the first time in their manufacturing career KTM are using fuel injection systems. Like many of their other models riders still have the ability to switch to alternate engine maps. The amazing EFI system detects the changes in temperature, and elevation to ensure that the dirt bike is receiving the perfect fuel amount at all times. On top of everything else, the new 350 will also be an electric start, but has the ability for the rider to kick-start the bike as well. This allows riders to have greater control, and the precise say in what they are doing. Although the body remains very similar to older models there are slight changes there as well. The frame design has allowed there to be increased torsional rigidity, and this has improved the ride quality. Although KTM wants the 2011 KTM dirt bikes to be a brand in their own right, they also want them to ride in a similar way to the 250s. The nimble factors of the smaller bike have always been very appealing just never quite enough power for some people. By combining all of their talents and manufacturing skills, KTM believe they have come up with the dirt bike of the year.